of square section with shallow sides, surmounted by a well carved crouching dragon in openwork, the mythical beast rendered with finely incised beard and mane, bulging eyes and powerful claws, depicted standing foursquare with an arched back forming with a long tail curling upwards along the spine, the square seal face crisply carved in archaistic script with Tangshi zizi sunsun yongzi wei xiang ('innumerable descendants of the Tang family to be trusted as counsellors-in-chief'), the lustrous semi-translucent stone of an even white colour - 3.5 by 5.4 by 5.4 cm., 1 3/8 by 2 1/8 by 2 1/8 in. Provenance: Bluett and Sons Ltd., London, c. 1975. Collection of Alan and Simone Hartman. 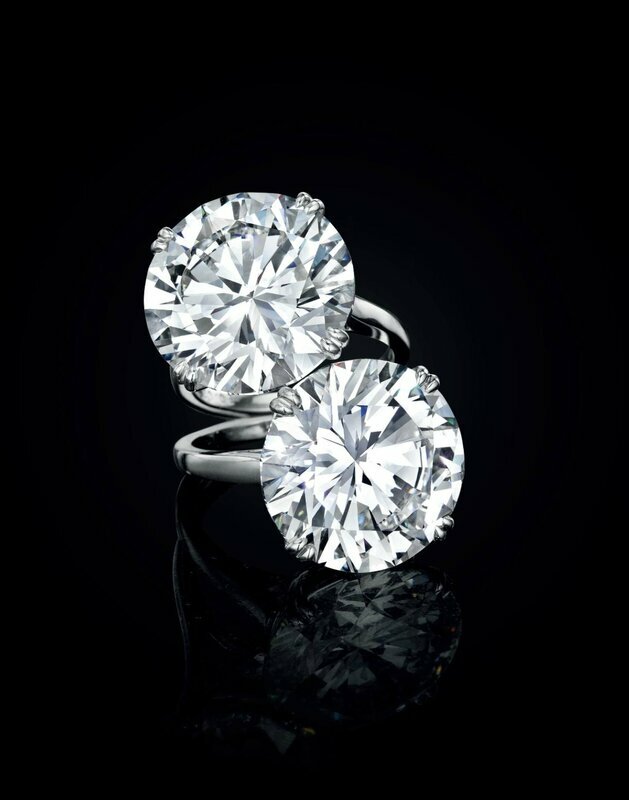 Christie's Hong Kong, 28th November 2006, lot 1357. Exhibition: Museum of Fine Arts, Boston, 2003-04. Bibliography: Robert Kleiner, Chinese Jades from the Collection of Alan and Simone Hartman, Hong Kong, 1996, no. 47. 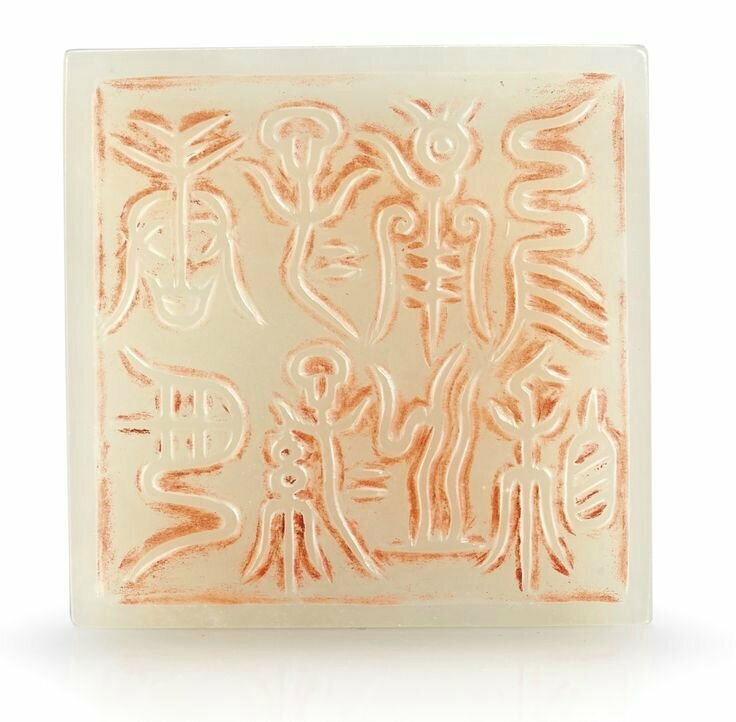 Notes: Boldly carved from a luminous white jade pebble that is without blemish and of an even warm-white hue, Yuan seals of this type are extremely rare. 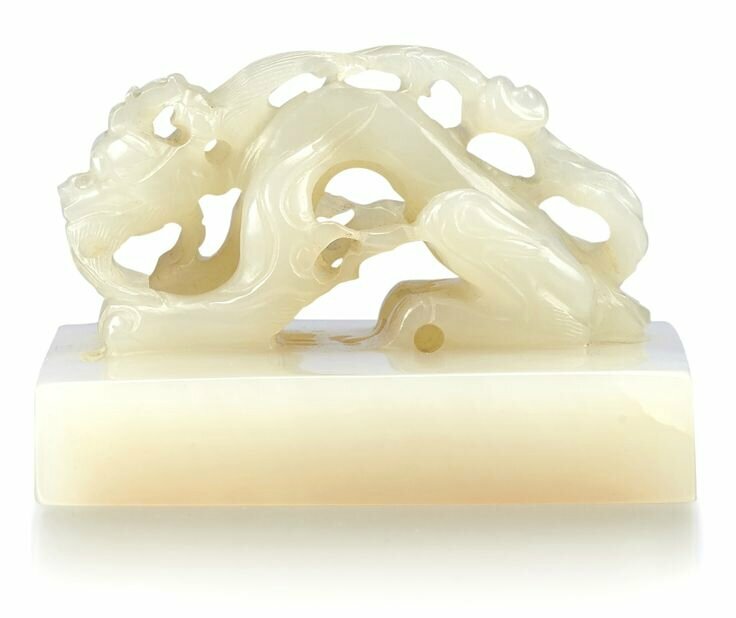 Delicately formed in openwork and finely finished with few traces of the polishing wheel, the arching dragon’s body has been rendered smooth and without scales. Its sinuous body is surrounded by small flames and tapers to a thin neck that supports a powerful head with protruding eyes, long mouth and slightly upturned nose to embody the characteristics typical of of Yuan dynasty animal carving. Together with the strong, stout legs, this dragon strikes an imposing countenance. Only one other closely related example, the seal face later recarved under the Yongzheng Emperor, appears to be known, and was sold in these rooms, 5th October 2011, lot 1908. 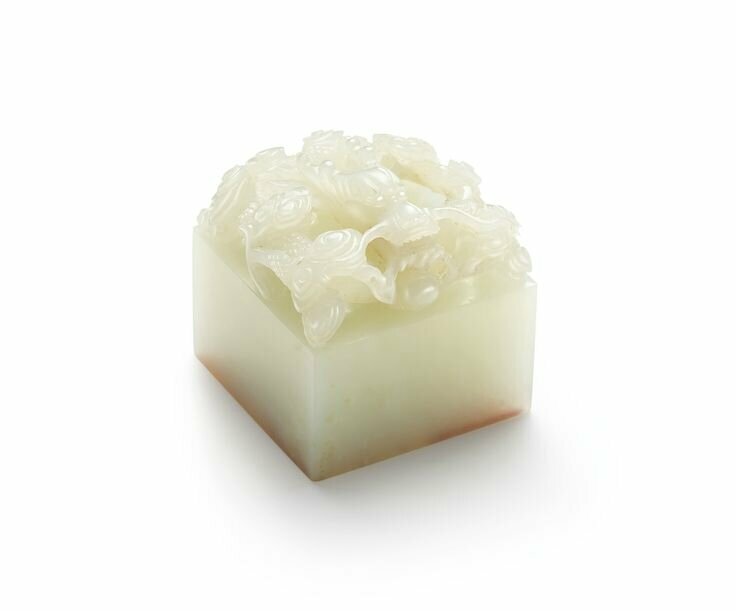 Jade seals surmounted by dragon-shaped knobs of the Yuan dynasty are rare; see a rectangular example, but carved with its claws gripping the edge of the seal, in the Palace Museum, Beijing, illustrated in The Compendium of Collections in the Palace Museum. Jade, vol. 5, Tang, Song, Liao, Jin and Yuan Dynasties, Beijing, 2011, pl. 266, together with a slightly larger square seal, but with a less ornately-carved dragon, pl. 267; another square seal attributed to the 14th-15th centuries, included in the Oriental Ceramic Society exhibition Chinese Jade Throughout the Ages, Victoria and Albert Museum, London, 1975, cat. no. 342; and a fourth seal, also with an early Ming attribution, included in the exhibition Dr Newton’s Zoo, London, 1981, cat. no. 46. 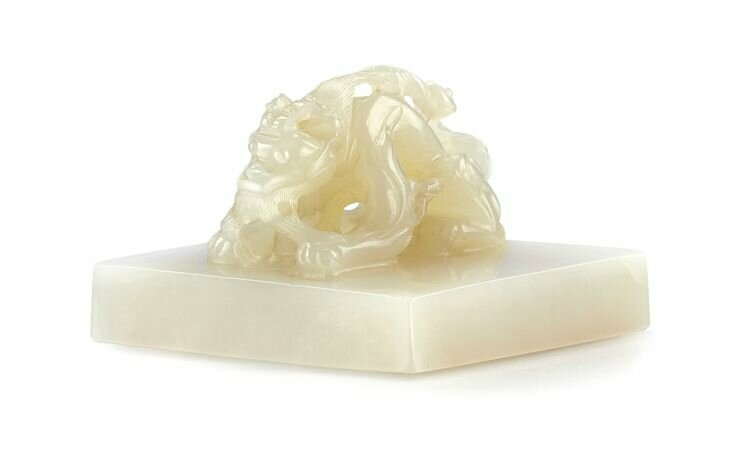 See also a celadon jade seal with a knob in the form of a tiger, excavated from the tomb of Fan Wenhu (d. 1301) and his wife, Anqing, in Anhui province, from the Anhui Provincial Museum, illustrated in the exhibition catalogue The World of Khubilai Khan. Chinese Art in the Yuan Dynasty, Metropolitan Museum of Art, New York, 2010, fig. 27, where the author notes that ‘[s]uch seals could be used only by imperial dispensation; other seals were of wood or ivory’ (see p. 17). The widespread use of paper and printing transformed the application of seals from impressions in clay to stamps using red seal paste. As a result, the surface area of seals increased in size and seal scripts varied from seal script, regular script, clerical script and the use of pictograms, and a new scholarly custom of leaving seal impressions on calligraphy and paintings emerged. During the Yuan dynasty official seals were a token of political authority. Official seals produced in the Yuan Empire included those for emperors, princes, preceptors or emperors, preceptors of state, various feudal princes and other officials. 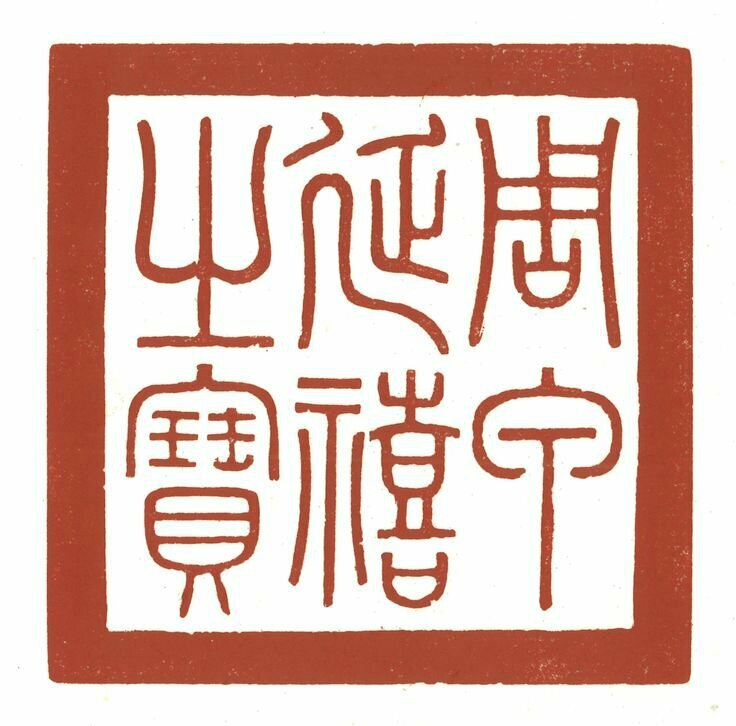 According to Xin Yuan shi [New Yuan History], all the official seals of the Yuan were produced centrally by the Ministry of Rites of the Secretariat by strict regulations. Different materials, designs and sizes were used according to rank, such as gold for princes and feudal princes, jade for preceptors of emperors and state, silver for upper first to upper third rank officials, and bronze for officials of third rank or lower.